Panasonic HDC-TM700 High Definition Camcorder is considered to be one of the best HD camcorders from Panasonic. It provides true 1920 x 1080p HD recording to a built-in 32GB flash memory. For many Mac users, how to playback video footage from TM700 AVCHD MTS files, at the same time, preserve its original HD quality is a question. In this guide, I will introduce an alternative software program of HD Writer AE for Mac OSX – Aunsoft Final Mate for Mac. As an AVCHD joiner on Mac, Aunsoft Final Mate for Mac is capable of merging AVCHD MTS recordings from TM700 without re-encoding. So it makes easy to burn video recordings to a Blu-ray disc and maintain its original quality at best. The following is a step-by-step guide on how to join TM700 AVCHD MTS to Blu-ray disc. 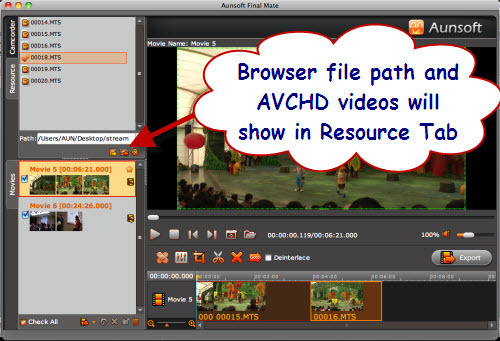 There are two methods that you can import AVCHD videos to Aunsoft Final Mate for Mac. On is from camcorder directly, the other is from computer. First of all, turn on TM700 and connect it to your Mac computer. Launch Aunsoft Final Mate for Mac from Application folder. A pop-out window will show and ask for permission to launch camcorder wizard. 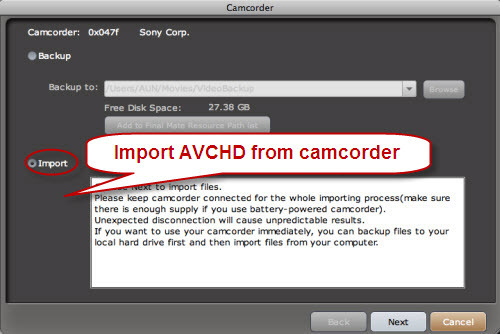 Click Ok and follow the instructions on Wizard to import AVCHD MTS videos to the program. Or you can directly import AVCHD videos from your computer. In this case, you don’t have to connect your camcorder to computer. Just Launch Aunsoft Final Mate for Mac and click on Browser button on Resource Tab. First of all, create a blank movie for lossless joining TM700 AVCHD MTS clip into one by clicking on File button in Navigation bar. 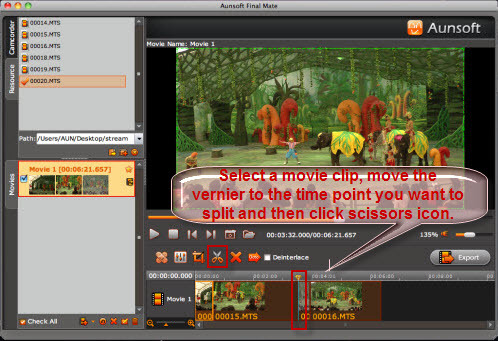 Then you can directly drag and drop files into this blank movie to joining AVCHD MTS clips into one. For splitting unwanted scenes of your movie, just move the Vernier to the time point or position you want to split the movie and click button. Then a movie will be divided into two parts. Click to select a clip you want to delete and click on button. You can also preview the effect in preview window. Choose Export button and start exporting TM700 joined AVCHD MTS movie. Once the process is complete, you can access exported MTS movie by clicking on “Browse for Export Path” on output window. With a Blu-ray burner, a blank Blu-ray disc as well as Blu-ray burning software, you are able to easily burn edited AVCHD MTS movie generated by Panasonic TM700 to blu-ray disc and retain its original High Definiton 1080/60p video at most.